I settled in the back row of BridgePark Manor’s multi-purpose room and tapped my toes to the jazzy gospel beat. 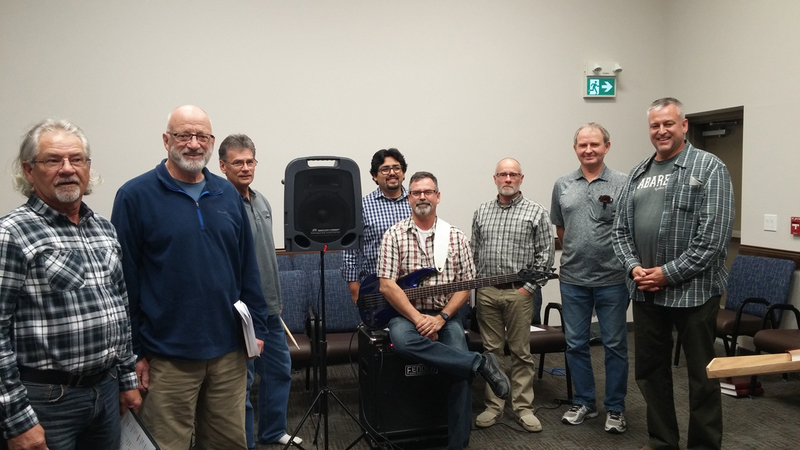 LANDMARK, Man.—When Heartland’s musical men bridge the gap, that often widens when some of our elder church members move to Steinbach, something amazing happens. On Oct. 16, 2017, the band—Duane Froese (piano), Gary Toews (percussion), and Dave Andres (bass)—opened the first set with their musical rendition of Church in Wildwood and When the Roll is Called. I settled in the back row of BridgePark Manor’s multi-purpose room and tapped my toes to the jazzy gospel beat. Dayton Plett led the congregation, singing choruses of victory and power and of longing and devotion toward God. The HCC quartet (Al Reimer, Bernie Neufeld, Dayton Plett, and Reinhold Wiebe) added their voices to the throng. Duane introduced us to a special guest, his friend Julio Cesar, a Christian man he had met three months prior and who is trying to emigrate from Bolivia with his young family. Though Julio didn’t speak much English, he sang familiar Christian tunes in his own language. And Rev. Jake Froese expounded scripture and preached the good news in three short sermon segments throughout the evening. The hour flew by. The room was filled with the Spirit of God in the people of God. And after the service the men visited with attenders. I am grateful for their willingness to serve. The chasm between affluence and poverty is wide, but the Christian band, The Color, ambassadors for World Vision, have helped bridge that divide through the well-known sponsorship program. The Band held a Saturday worship night and concert on Oct. 21 at HCC, which drew just over 200 people of various ages. Through the group’s effort six first-time sponsors signed up during the concert. And during the intermission HCC social committee served up sundaes at their ice cream bar.